Over the past few weeks we have had some really warm unseasonal weather. 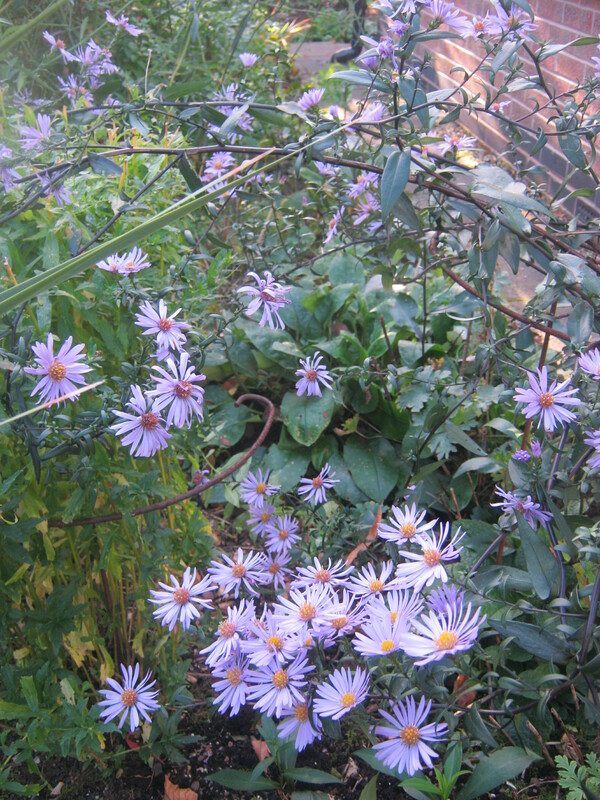 This has prolonged some of the summer display making the garden seem more like late summer than late autumn. 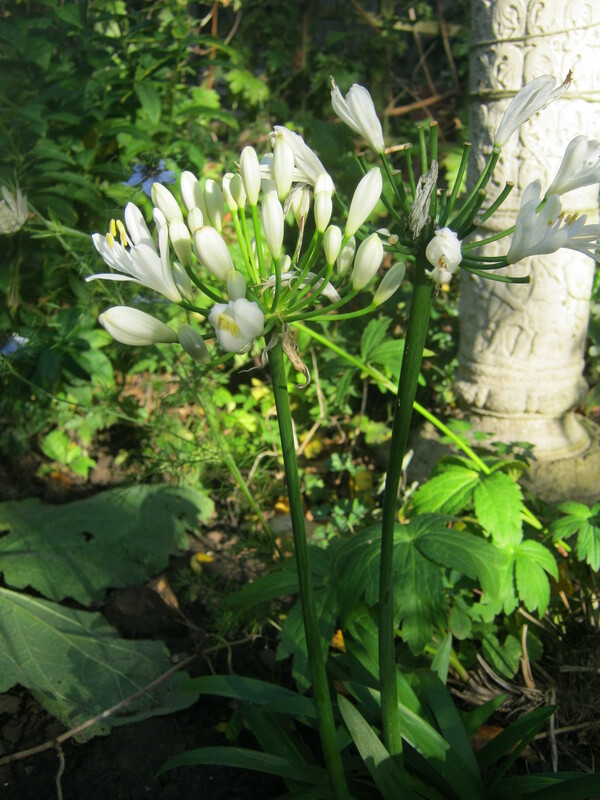 This Agapanthus was taken out of a very pot bound pot and planted, against some peoples advise, into the ground. It had not flowered for years and I was fed up with having to take this and 5 other pots of Agapanthus into the shed every winter. So kill or cure. 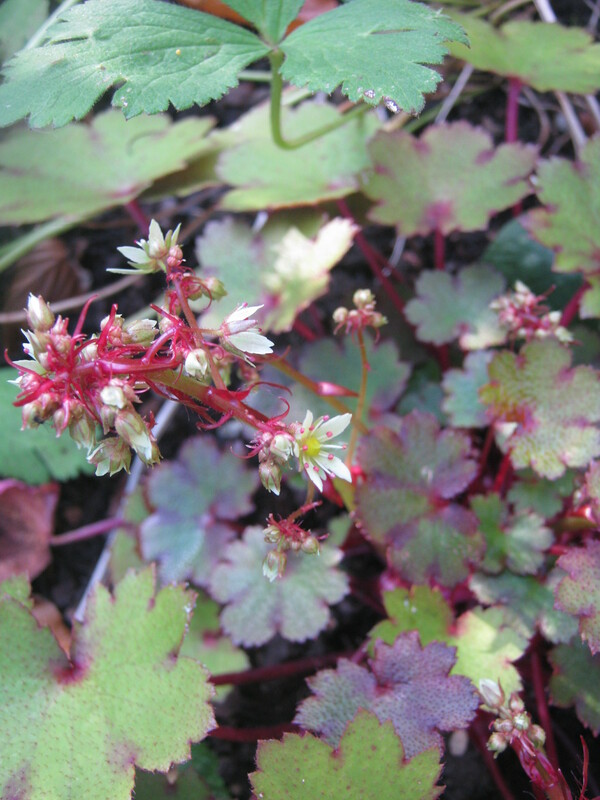 To my surprise it has flowered non stop, now maybe I caught it when it was going to flower anyway, but flower it has and I am still enjoying them now. All the Salvias have done well this year, putting on lots of new growth and flowering still. That is except Wendy’s Wish, which is only just coming into flower now, and very welcome too. I have never known the correct name of this verbascum but it has been a weedy seedling around the garden for years popping up in cracks and crevices. Last year I decided to save seed and grow it properly. The result has been amazing, each plant having several stems of metre tall flower spikes. 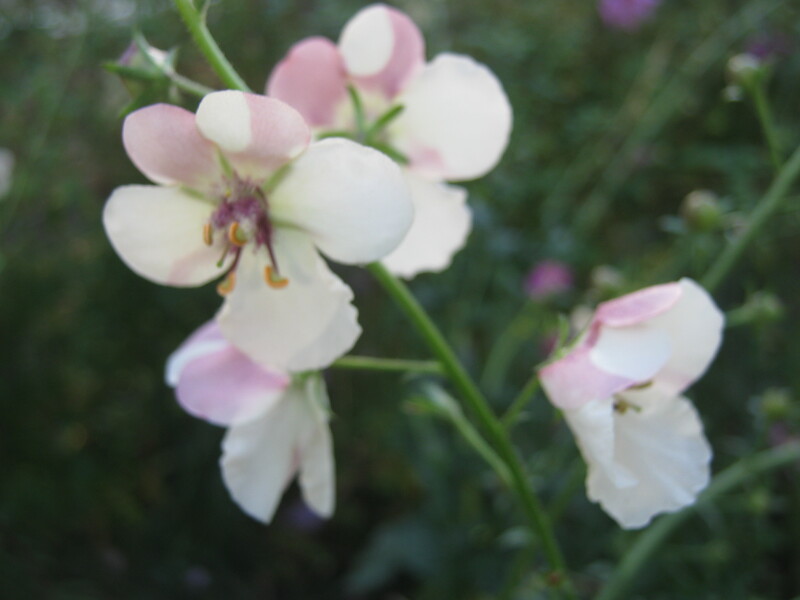 The flowers have beautiful pinky/purple blotches followed by attractive seed heads. Now I did use to think that this was V’ Chiaxii but it’s the markings that have thrown me. What do you think…. Why the name I don’t know, but such a stunning plant. 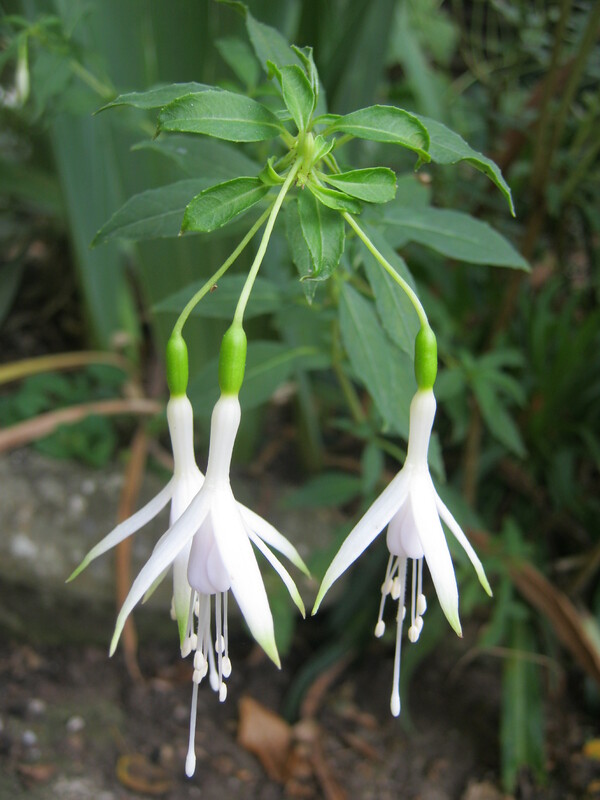 Just coming into it’s prime this is going to add some more interest to the small white garden…..
a lovely pure white hardy fushia, chopped to the ground each spring and growing not too tall as it is growing along a path and is probably a bit restricted. 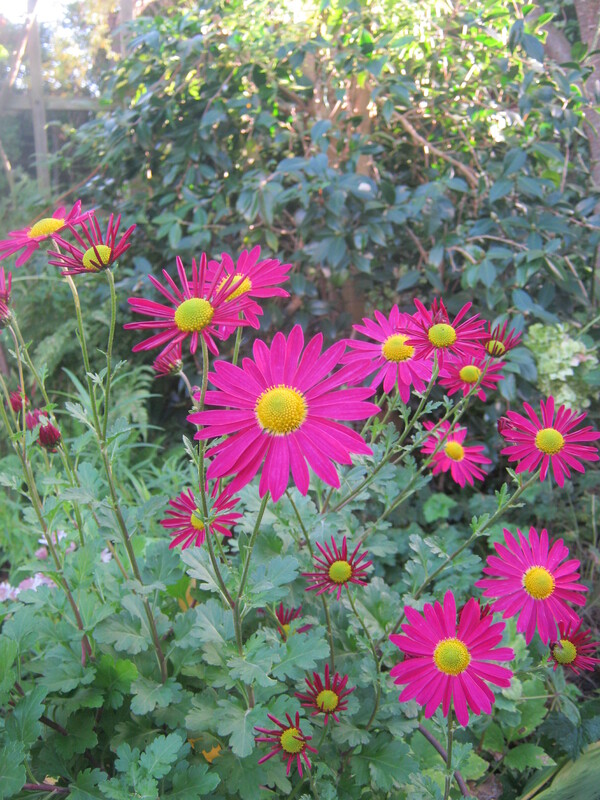 A stalwart for me has to be this gorgeous Chrysanthemum ‘Jessie Cooper’. It never fails, with a couple of ‘Chelsea Chops ‘ during the summer it makes an imposing statement at this time of year with loads of cutting material and very long lasting in a vase. 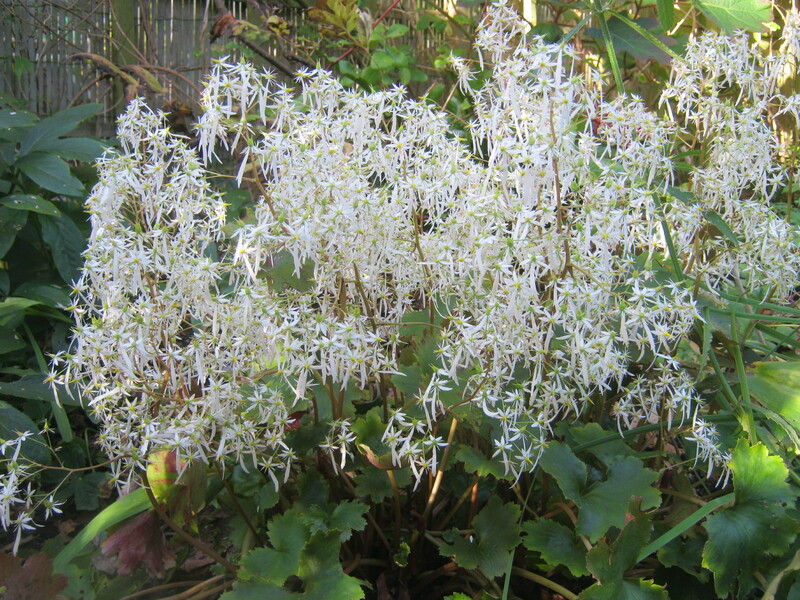 One for the back of the border, with maroon/black stems and leaves growing to about 180cms. Although I have over the last few years been doing a ‘Chelsea Chop’ on this too and it seems to help keep it in bounds height wise. And to finish my autumn display. 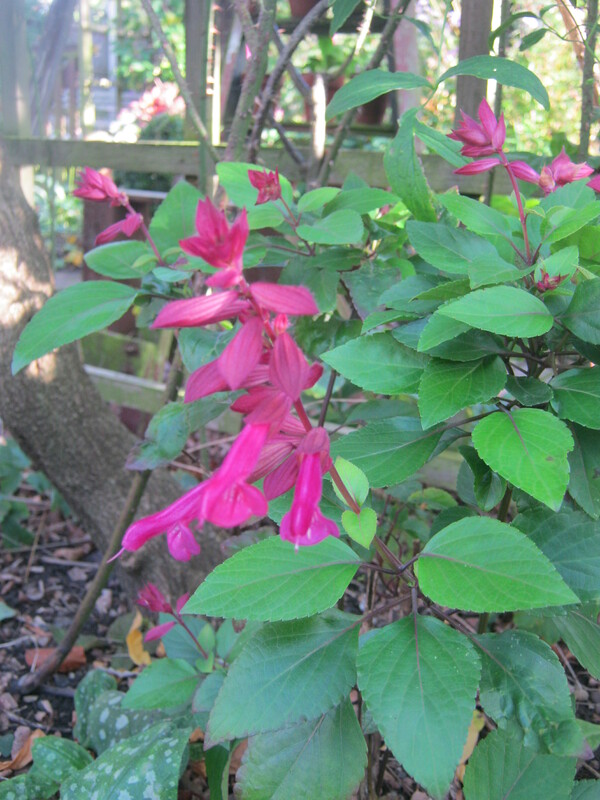 Fushia Paniculata, now I am reliably informed that the fruit of the fushia is edible but tasteless, that aside I am pleased with this plant as it was a bin end from a N/T garden at the end of the summer. 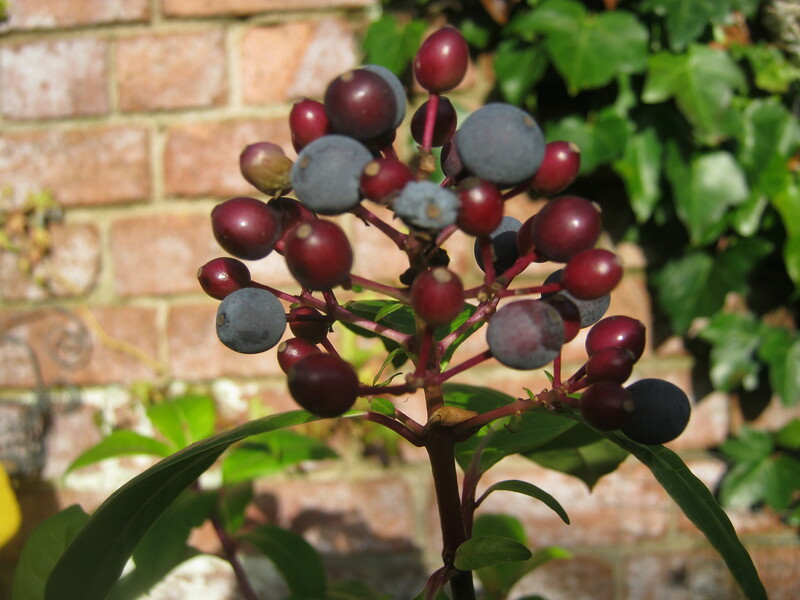 Having never grown it before I was pleased with the amount of flowers it produced and with the fruit as a bonus, looking more like a blueberry than a normal fushia fruit. Seeing this in large garden displays has inspired me to take lots of cuttings as I think this would look great sitting along side the leaves of beetroot and possibly chard…… the steroids are kicking in …I’m beginning to plan again with gusto… watch this space….. So now you have a lovely piece of fabric created by you. You won’t find another like it, it is unique to you. After pressing the fabric and choosing a lining, finding an old recycled zip to use, I have trimmed the patchwork to a rectangle shape. Then cutting it down the middle I have now got 2 pieces measuring approx’ 25 x18 cms, cut 2 pieces for the lining the same size. When choosing the zip find one that is the same length as your longest edge, cutting to size if it is too big. 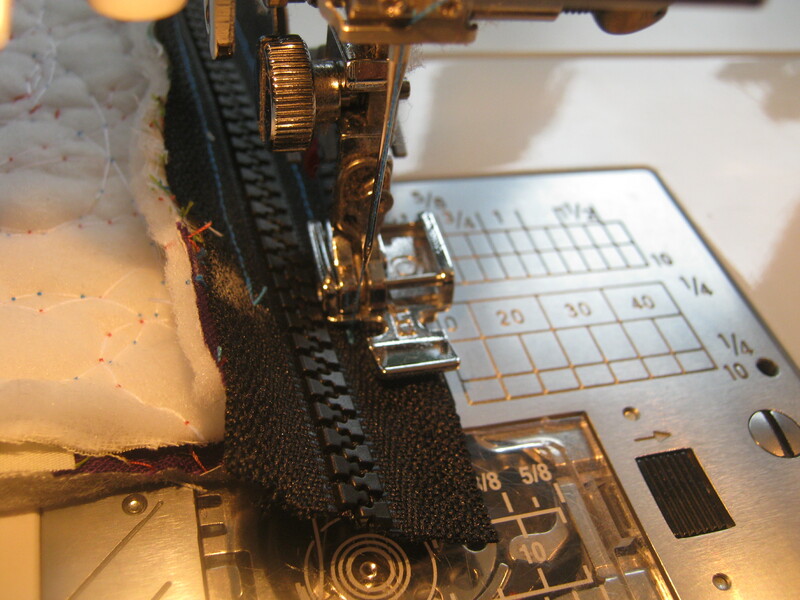 Lay the zip along the long side and stitch using zipper foot, starting and ending 1 cm in from the start and finishing 1cm before the end. 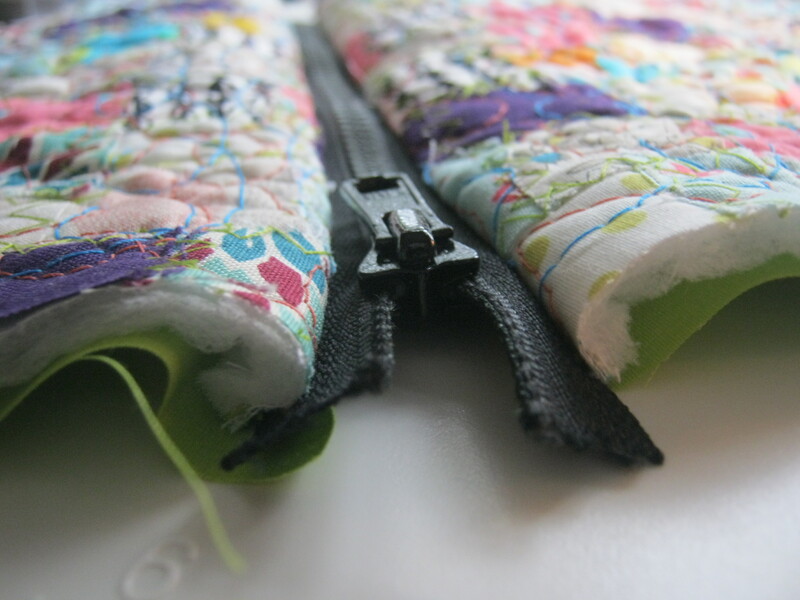 Do the same to the other side of the zip,attaching to the other piece of patchwork. Finishing 1cm before the end. Now sandwich the lining to the seams you have just finished. You now have a completed zip. Do not worry about the ends of the zip all will become clear later. With the patchwork pieces R/S to R/S and likewise the lining, pin the seam all the way around, leaving a 6 cm gap for turning at the bottom of the lining. Start to stitch the seam at the start of the lining, tucking the ends of the zip towards the lining,finishing as close as you can get to the zip, do not stitch over the zip. Carry on around the bag,stopping and starting before and after the zip. To make a really nice professional looking bottom to the bag, we need to square the bottom off. 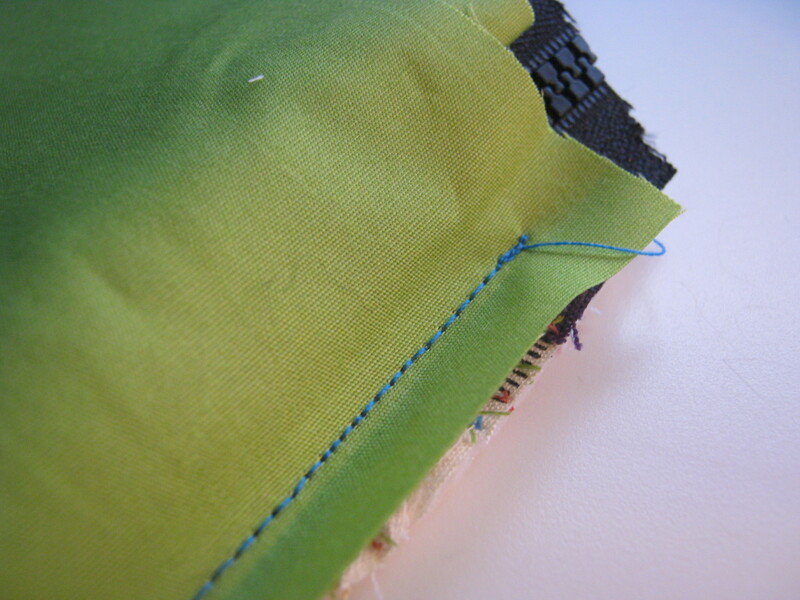 Opening out the corners of the bag bottom and matching the side seam with the bottom seam, pin and mark 6 cms across. Do this to all 4 corners before you start to stitch. 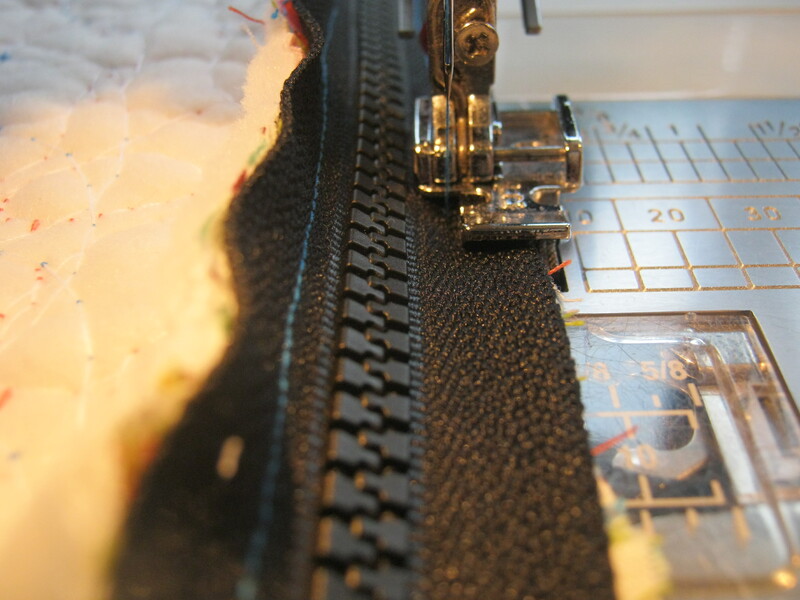 Stitch and trim seam allowance. Turn the bag through the gap in the lining. Press the gap seam to neaten. 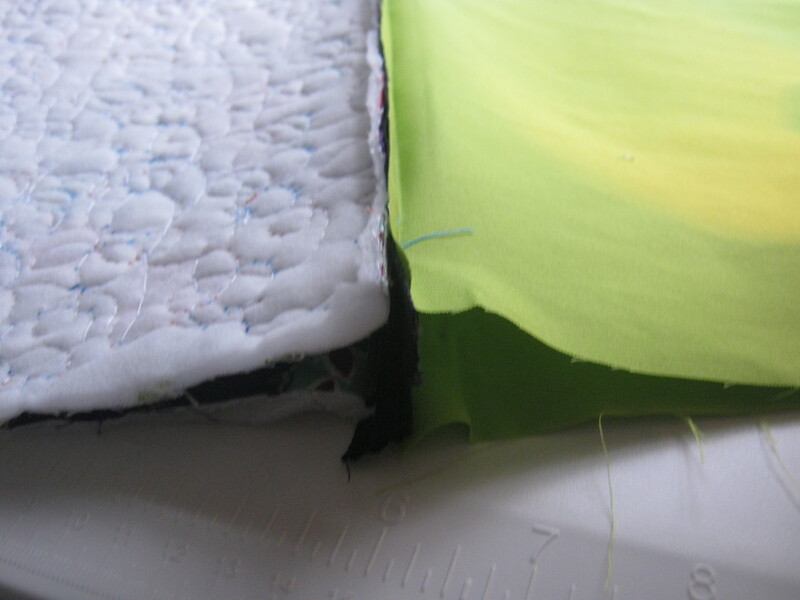 Making sure all the points on the corners are poked through neatly too, hand stitch or machine the gap closed. Now you will find that the zip ends have sat in nicely. Steam press around the top where the zip is, covering the fabric with a cloth if using a plastic zip. And there you have it …one make-up pouch…made from scraps of fabric and a little imagination. I have been using this cheats patchwork for quite a few years now, the first time it was for a college piece (a very mature student). I made a bodice / basque for a project. Using lots of sheer fabric, a bit of glitter, silk and lace I did exactly the same technique with hand and machine stitching and burning some of the fabric back with a hot gun. This made for a very individual piece. I hope this will inspire some of you crafters to look at scraps of fabric that you would other wise throw away to think again and create something that is very personal to you…. This summer I have made several zipped tote bags for family and friends, each time I make one I end up with 8 small 6 cm squares, and you know me I have to use them somehow. The school lunch totes for the girls . Tote for my daughter – in – law to use in her new job. A tote sent to Korea to my lovely friend Li-anne. A bit of indulgence, well a girl can never have too many bags. I thought I would share with you this tutorial for using up odd bits of fabric, and as you will see they can be any type, just fairly regular in size. All of the little squares were bonded to a muslin backing fabric. These were then stitched down using a large zig zag stitch. Don’t worry about neatness, this is quick and rustic. 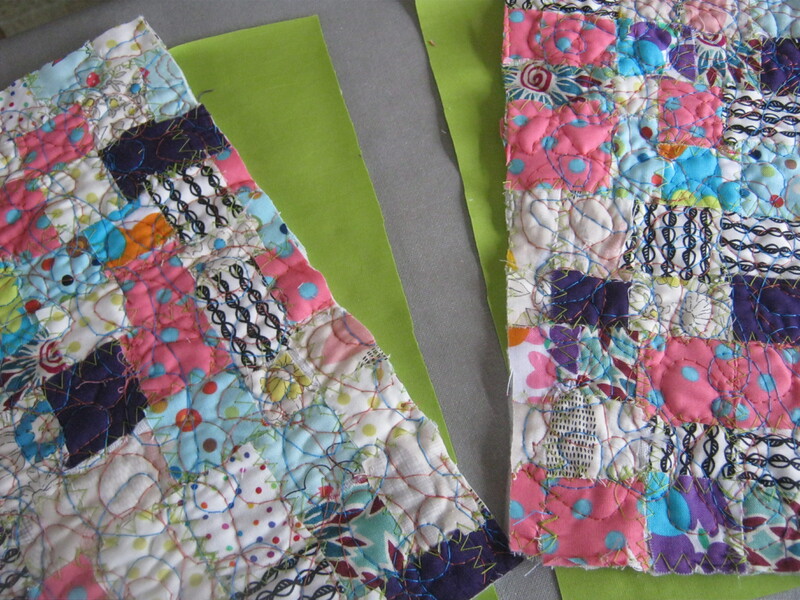 Lay the fabric on a surface and cut up through the whole patches. Taking every other strip, turn them 180′, creating smaller, narrow patches. Machine zig zag again these new smaller patches. 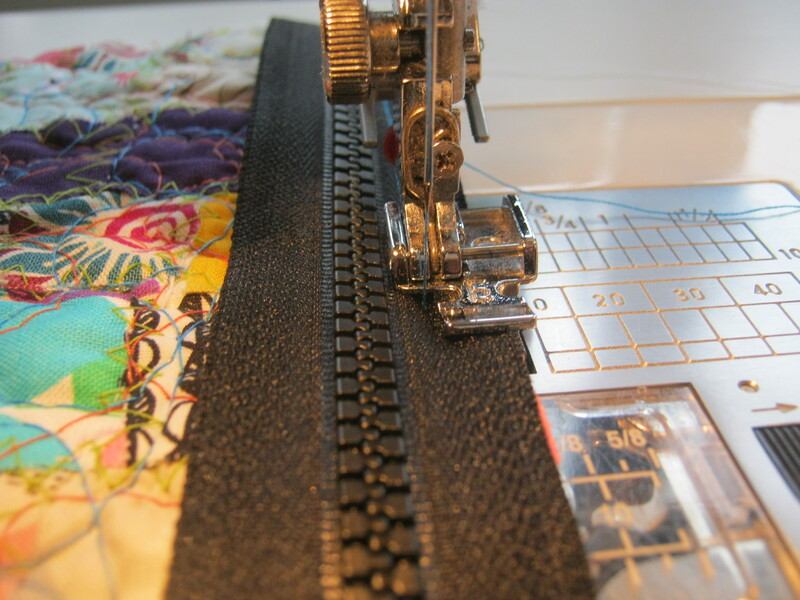 Doing the same again, cut up the width of the patch and turn every other one 180′. Next bond the whole of this fabric to a piece of bondable wadding. Change your machine foot to a free machine embroidery foot or darning foot, dropping the feed dogs, lift the needle tension. And away you go. Using the needle as a pen and lots of smooth movements, create swirls in a couple of different coloured threads. This strengthens the fabric and quilts at the same time. And there you have made yourself a piece of usable fabric that you can use to make all sorts of things. You may have noticed over the last few months I’ve not posted much about sewing or actual gardening. More viewing than doing. Well these have been challenging times to say the least. For the last 30 ish years I have had a condition call Sarcoidosis, ( google if you want rather than me go into detail ). I have only had 3 flare ups in all that time but this one is the worst I’ve had. I had been losing weight over the summer and getting more and more tired, I am only a slight person anyway so the weight lose was significant. Me being me I try not to complain, more just get on with things, but it’s difficult not to give in when you are getting more and more frustrated because you haven’t the energy or the inclination to do the job in hand in the first place. Matters came to a head a few weeks ago when my best friend came over and said ‘Sue you look dreadful, can’t you see somebody about this’. This is a proper friend who says it like it is and I am so grateful to her for being so bluntly honest. So 2 days later I was seeing my specialist and things got going. I am now taking an 18 month course of steroids and yesterday I had a biopsy in my nose and throat. All went well and the thinking is that it is 99 % sarcoid with a 1 % ??. I have been on the steroids for 10 days and I have to say that the gloom I was feeling has lifted and it will only be a matter of time before the energy levels rise. Other things I have to live with but I am ever the optimistic so life goes on, the planing for next year starts now, with lots of tearing out and replanting with Mr Malc at the helm and me doing the supervising we will win. And for the beauty I have looked at my past pictures to find something to cheer me and hopefully you my faithful viewer on this my happy day. Always a joy to have Granddaughters doing what they do best showing off to nana. 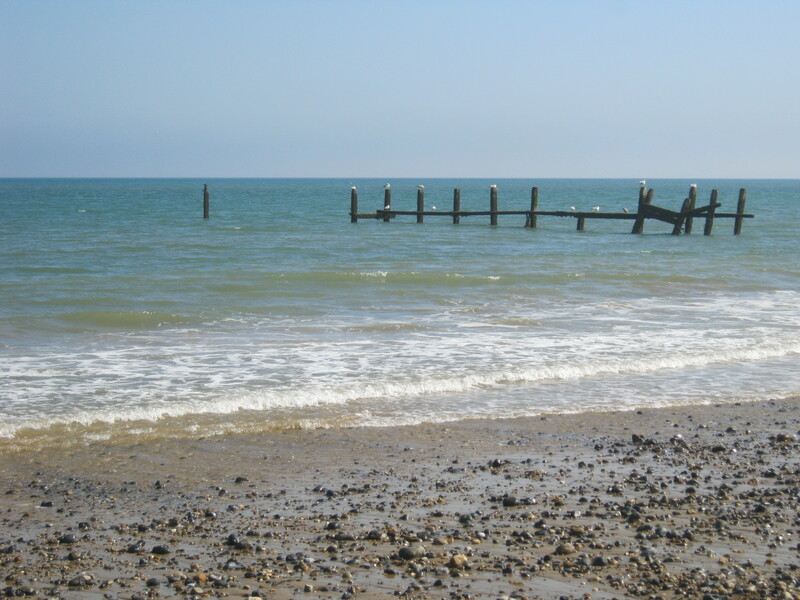 Norfolk in the summer, along with North Wales some of our favorite beaches. 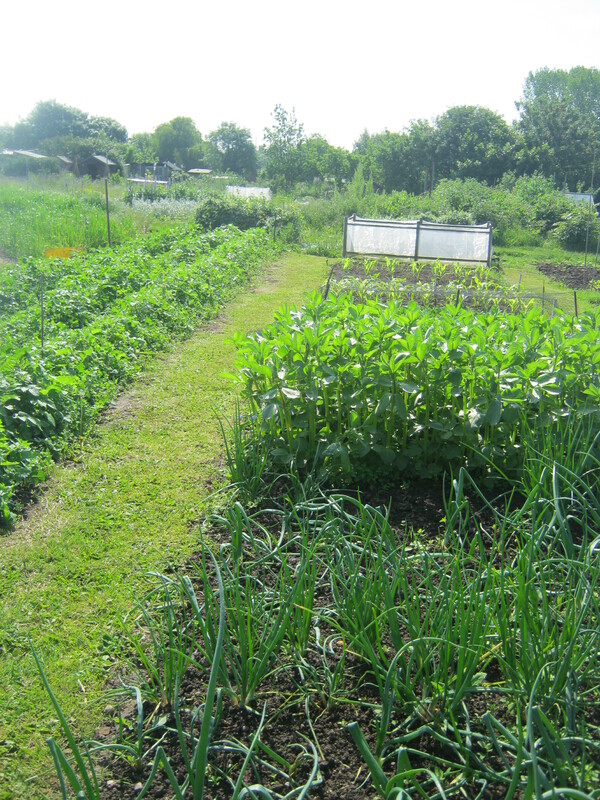 Mr Malcs allotment earlier this year looking full to bursting and a brilliant tonic all this fresh produce.